Note: Except for Hong Kong, all the rest are from Manila. Hong Kong promo is for flights coming from Cebu. Please take note that the figure shown above is just the base fare. Cebu Pacific began showing base fares recently in contrast with their previous practice of showing the all-in fare. On top of base fare, the passenger will need to pay taxes, admin fees and other charges. These charges can quickly add up. Oh by the way, when booking, be extra careful. It's a general practice for airlines to put all sorts of stuffs to your flight by default like baggage, choice seating, insurance etc. You may need to manually disable these add-ons. Otherwise, you'll unwittingly pay for them. And just like I said, the cost can quickly add up. 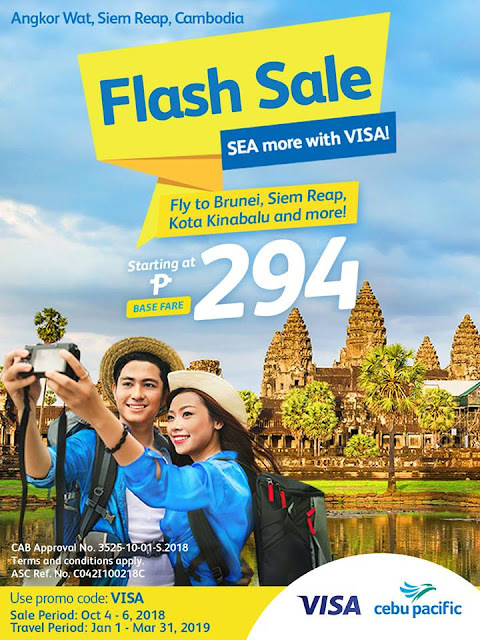 Except for Incheon,South Korea, the rest of the international destinations in this seat sale promo are visa free for Philippine passport holders. For example, you can visit Hong Kong for up to 14 days without visa. Other countries above allows much longer stays. For the list of visa free countries for Filipinos, please see the article below.